Once you enroll in Medicare (either Parts A and B OR Medicare Advantage Part C); you may choose to buy a Medicare Supplement Insurance (Medigap) policy. These are plans sold by private companies, to help pay some of the health care costs that Original Medicare doesn’t cover, like copayments, coinsurance, and deductibles. There are 10 standardized Medigap plans available in every state (excluding Massachusetts, Minnesota, and Wisconsin, which all have their own versions). They are identified by letters F through O. You enroll in Medicare Supplement insurance during your Medigap Open Enrollment Period which is the six months starting the first day of the month in which you are 65 or older and enrolled in Medicare Part B (so, if you delay enrollment, your delay this period, too). If you wait to apply for a Medigap policy until after your open enrollment period ends, the Medigap insurance companies do not need to sell you a plan and can charge you more for it. The most commonly sold plan is Plan F.
Medicare Part F ( supplemental insurance) Part F is a Medicare Supplement insurance plans that covers costs known as Medicare Part B excess charges. An excess charge is the difference between what a doctor or provider charges and the amount Medicare will pay. 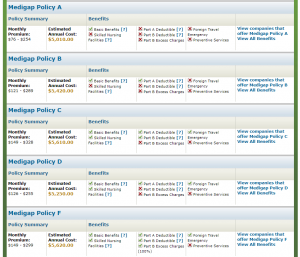 You pay a monthly premium for these plans (typical is $183). Insurance companies like Blue Cross, Aetna and Humana sell these plans. These plans will help protect you from additional out-of-pocket expenses if you have treatment that exceeds what Medicare will approve. Medicare supplement plans have the same basic benefits, even from different insurance companies, so you can compare one company’s “plan F” to another company’s “plan F.” See this page on the Humana website for more detailed information. Plan F is a popular choice that offers more overall coverage than any other Medicare Supplement plan. You can also choose a high-deductible Plan F for a lower premium. A quick search on the Medicare website gave plans averaging $5,000 per year ( $416). See the screenshot below. Go to this page to see which plans are available to you, as well as the specific coverage and costs.